Ridge-till-managed fields on the Alverson farm. Note the crop residue left between ridges. Soil organic matter is the cornerstone of soil health, productivity and fertility. If you want to grow a crop, you need it for two essential functions: first, as a revolving “nutrient fund” that helps distribute minerals that sustain the entire biome of flora and fauna within the soil and keeps life above and below ground in balance; second, to improve the physical structure of soil, maintain healthy tilth and absorb and hold water. More is better. Essentially all the carbon in the soil comes from the atmosphere: plants draw in carbon dioxide from the air and convert it to complex carbohydrates both above and below ground. Higher concentrations of soil carbon make for healthier soil systems and, by extension, better crops. Through the process of photosynthesis over the course of a growing season, the atmosphere literally feeds carbon to the soil. “The idea is to save all the residue from the previous year’s crop down between the ridges,” Keith Alverson explains. “You leave residue on the surface. Minimum till allows the soil to build up natural structures through root channels and earthworms and you’re reducing organic matter decomposition and CO2 release”. When organic matter decomposes, it releases nutrients in a plant-available form. Because lifeforms within the soil — the “biota” of the soil — break down carbon structures in crop residue and store or rebuild new carbon structures, soil biota plays the most important role in nutrient cycling processes and, thus, in the ability of a soil to provide the crop with sufficient nutrients to harvest a healthy product. In order to sustain a balanced nutrient cycling, the rate of organic matter addition from crop residues, manure and other sources should equal the rate of losses from organic matter decomposition. In other words, carbon is the cornerstone of a much larger process that drives fertility and crop yields. Before most of this was well understood, 20th Century farmers learned the hard way what happens when you loose soil carbon. Prior to the arrival of settlers, the native prairie soil had a positive carbon balance. No carbon was exported from the land. Buffalo grazed the prairies, but the carbon in the grass they consumed was returned to the soil in the form of manure and their carcasses. When settlers moved in and started growing crops to produce grain and meat for food for people in cities, carbon started to be exported from the land. Compared to the prairie, annual carbon additions to the soil were significantly reduced. But this was only half of the story. In order to control weeds in their crops, farmers used extensive tillage, and this decomposed existing soil organic matter stocks, releasing carbon to the atmosphere. Tillage also exposed soil to wind and water erosion. The most traumatic lesson came during the Dust Bowl of the 1930’s when wind erosion stripped organic matter directly off fields and wrecked soil fertility. By the middle of the last century, many areas lost 50% of the prairie’s original soil organic matter stocks. That was standard operating procedure around most of the country until the mid 1970s. The consequences weren’t as obvious as a dust storm, but data revealed an alarming trend. 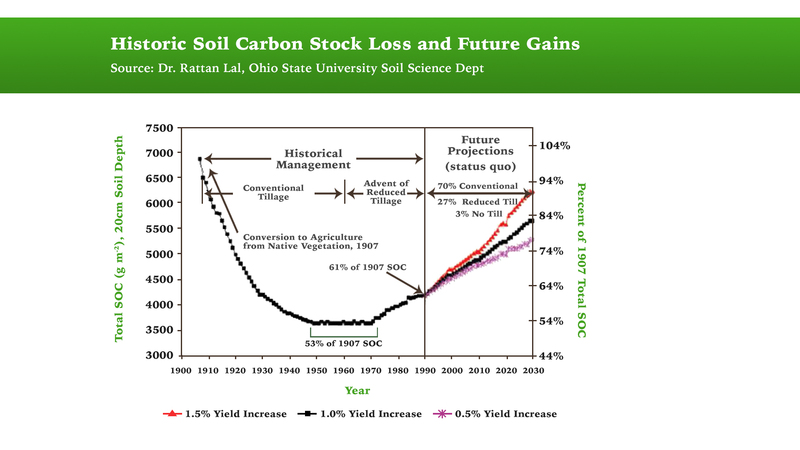 According to a study by Ohio State University’s Soil Science Department, US soil organic matter plummeted by half between 1907 and 1947, a direct correlation with low yields and the heavy use of conventional tillage. Total organic matter content stagnated for the next 25 years at approximately 53% of the carbon content of native prairie. The precipitous decline in soil organic matter coincided with heavy conventional tillage. 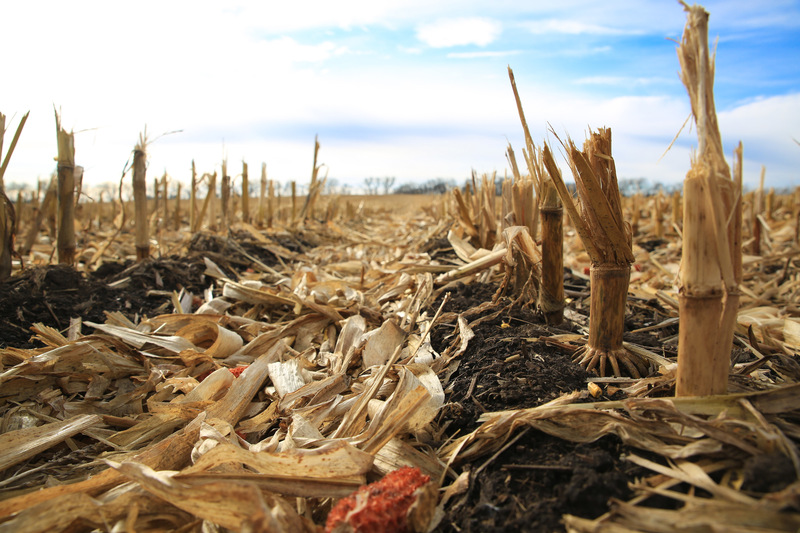 A rebound began with the advent of no-till and low-till practices. Projections now show the average soil organic content around 75 percent of levels measured in 1907. Only by the early 1970’s, with the advent of chemical weed control that allowed low-tillage management, breakthroughs in plant breeding and rapid increases in crop yields — and after six decades of cratering organic matter — did soil carbon begin to rebound. Slowly. Gaining Carbon Back in Our Soil: Ron Alverson describes the results of his 30+ year quest to improve soil organic matter in his fields. In 1983, Alverson was 32 and the fifth generation to manage the family farm. It was his turn to confront the challenge of replenishing soil carbon. For the modern-day Alversons, the challenge was to manage weeds and grow bigger crops while simultaneously improving soil organic matter — not just preventing its loss. That’s where the art and science of soil design was born. In the Alverson’s part of the country, one cornerstone is a low-till management strategy known as “ridge-plant:” crops are planted in raised ridges that are left undisturbed. 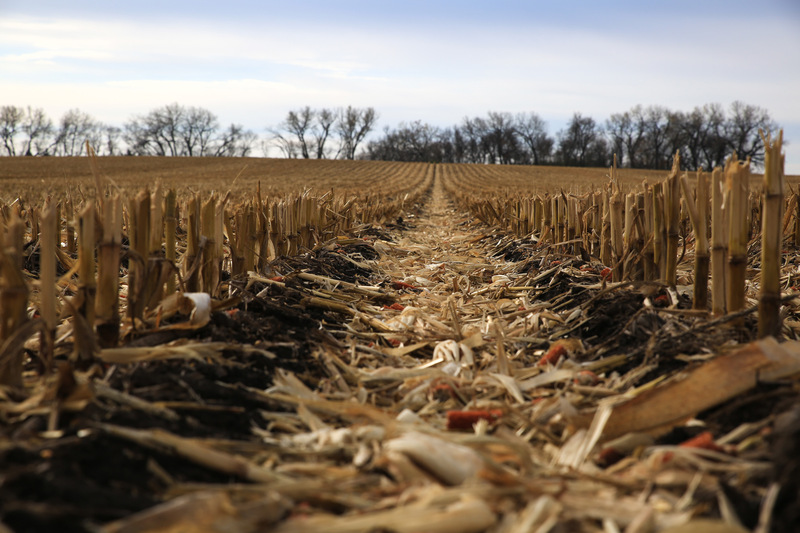 Corn residue is left between the ridges where earthworms, bacteria and fungi dine on the carbs and protein in the residue. Soil scientists call this soil organic matter formation process “humification”. The ridges rise above the stover and absorb the warmth of the sun in order to accelerate the seed growth in the cool, early weeks of each new growing season. Ridges that have not been plowed since the Columbia Space Shuttle made is inaugural flight. Aside from planting and the gentle dislodging of the previous year’s stalks each spring, the ridges on the Alversons’ fields haven’t been disturbed since M.A.S.H. aired its final episode. With thirty-three years of record-keeping on the soil organic content of his fields, the Alversons have been able show how corn crops and ridge-plant have driven the carbon content of his fields up across the board — in some cases to levels rivaling native pastures and prairies. In other words, careful crop and soil design can lead to carbon harmony.